A parlor game at the wedding reception may sound childish to many people but it is a nice way to have fun along with friends and family. Also it would also help make the wedding eve more special and memorable for the bride and groom. 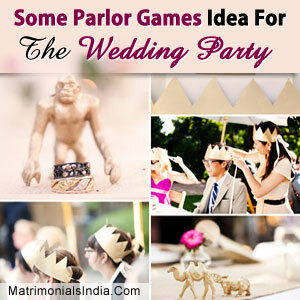 There are many entertaining yet simple games one can play at the wedding reception. In the following write up, there are a few suggestions for parlor games that can be enjoyed at the reception. The Blind Fold Game : This is a really popular game at wedding receptions and it can be really entertaining too. All the male guests present in the wedding party are lined up & the bride is blindfolded. Next the bride's friends lead her to all the men in the party one by one, & she has to find out which one the groom is by touching. To make the game more fun, some clues could be given to her. The Couple Game : All the couples present in the wedding party could be given different titles like the cutest couple, the madly-in-love couple the most handsome couple, the best dressed couple, the funniest couple', etc. You just have to get creative and funny with the titles you come up with. The First - Time Game : This game would specially be enjoyed by the newly-wed couple as this game would specially involve the bride and groom's participation. It basically involves giving the guests a blank paper each & asking them to write down a question starting from first-time. For instance, first time the couple met, what did they think of each other? First date they had? First time they realized they were in love? First fight? and so on. The game could be made funnier with quirky & creative questions. It would also help the couple relive some of the best moments of their courtship period. There are many other parlor games that one can easily enjoy at the wedding party & make the most of this joyous occasion.